Sept. 26 (Bloomberg): The chief executive officer of Petroliam Nasional Bhd. will meet government leaders in British Columbia next week as the Canadian province prepares to unveil a tax regime that may decide the fate of billions of dollars of investment in liquefied natural gas projects. Shamsul Azhar Abbas will sit down with Premier Christy Clark and Rich Coleman, British Columbia’s minister of natural gas development, in Vancouver, said Sam Oliphant, a spokesman for the premier. Shamsul will be in the city on Sept. 29 and 30 for an update on the Malaysian state oil company’s proposed C$10 billion ($9 billion) Pacific NorthWest LNG development, according to project spokesman Spencer Sproule. Petronas, as the company is known, is among global energy producers pressing British Columbia and the government of Canada for financial terms that will make it worth their while to develop natural gas reserves and gas-shipping terminals to meet rising demand for the fuel in Asian markets. Shamsul, in comments published by the Financial Times newspaper yesterday, threatened to call off the Pacific NorthWest project because of regulatory delays, a lack of incentives and a proposal by the provincial government to impose a LNG tax. “The way things are developing, the project remains uncertain,” Shamsul was quoted by the newspaper as saying, casting doubt on whether the company would decide to go ahead with the development by the end of the year. 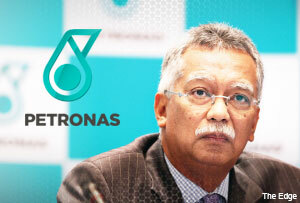 Petronas doesn’t have anything to add to its CEO’s comment, according to an e-mail from the company. British Columbia, which predicts LNG activity could add as much as C$1 trillion of gross domestic product by 2046, has set a goal of having three LNG projects in operation by 2020. Clark has previously forecast the province may wipe out its government debt with royalties and taxes from LNG. Next month, the province plans to introduce legislation that will include tax rules for the industry, Finance Minister Mike de Jong said earlier this month. The Petronas project includes a pipeline to deliver gas supplies from fields in northeast British Columbia to Lelu Island, near Prince Rupert, British Columbia, 770 kilometers (480 miles) northwest of Vancouver. The project would produce as much as 19.68 million metric tons of LNG a year for 25 years starting in 2018, according to an application to Canada’s National Energy Board.